It is a federal law that since 1992 has required technicians working for pay to be certified to recover and recycle refrigerant. It restricted purchase of R-12 to certified technicians. As of 1/1/2018, purchase of refrigerants of two pounds or more is restricted to certified technicians. A. The Mobile Air Conditioning Society (MACS) Worldwide provides testing on its website at www.macsw.org on the Section 609 pages. Testing is available online and in an independent home study format. Training classes for groups can be arranged by calling (215) 631-7020, ext. 304. Q.What score is needed to pass the test? A. A score of 84 must be achieved to pass the online or home study open book test. Proctored, closed book group test takers must achieve a score of 72. Q.I am already Section 609 certified. Do I need to be re-certified? A If you were certified anytime since 1991 there is no required re-certification! Your certification is good for life. However, in 2015 the Section 609 program was updated to include training information for working with R-1234yf. It is strongly recommended to re-certify to obtain this training if you plan to service R-1234yf vehicles. A. MACS Worldwide can provide a reprint of your Section 609 credentials ONLY if you were certified by MACS or IMACA. A reprint costs $10 and you need to completely fill out a form for MACS to search for your record. This form is on the homepage of the MACS website. If you were certified by another provider please contact that provider. A. Older Cards will not say HFO-1234yf, very old cards say CFC-12 and they are still valid. 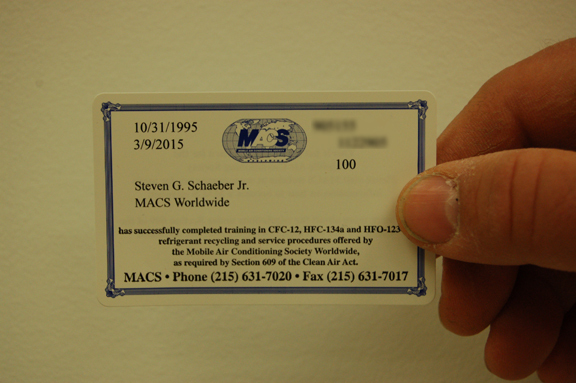 If a distributor disputes your card have them call the MACS office at (215) 631-7020 X 0. Q. I am in a rush…what’s the fasted way to be certified? A. Visit the MACS website at www.macsw.org and purchase and take the online test. As soon as you pass you can print temporary Section 609 credentials you can use until we mail your certificate and card. This entry was posted in #1234yf, Automotive Aftermarket, Automotive training, MACS Member, Mobile Air Conditioning and tagged #Section 609, #Section 609 Certifcation, HFC-134a, mobile air conditioning, professional service, recovery recycling machine, Section 609 Certification. Bookmark the permalink.